Do you laugh at very long awkward moments? You may have a comedy fetish. I laugh at the word pickles. That's me being honest about my pickle fetish. Basically it's just a stylish clip portal. Pick your fetish, and see clips from their shows...fetishes like Full-Frontal Confrontation, Nasty Comebacks, Premature Evaluations, or Redneck Raunch. Top it off with a co-promotion with Funny Or Die.com. 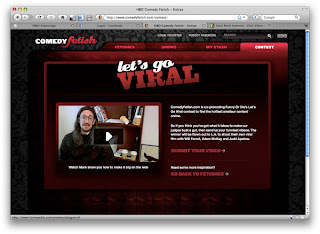 Never seen this particular promotion before - Submit your own funny viral video?! Sarcasm aside, it's a tight little package. Like a virgin hobbit. (another fetish of mine).